Hortus Camdenensis | Heteromeles arbutifolia (Ait.) M.Roem. 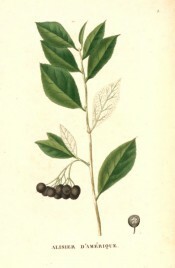 Half-hardy evergreen shrub with thick and leathery, lance-shaped leaves, to 10cm long, and flattened, terminal panicles of white flowers in late summer, followed by small red berries. To 4.5m. [RHSD, Hortus, Hilliers']. Introduced to Britain in 1796. [JD]. Loddiges’ Botanical Cabinet figures Crataegus arbutifolia. [LBC no.201/1818]. ‘Arbutifolia is from California, whence it was introduced by Mr. Archibald Menzies in 1796. It forms a handsome greenhouse-plant; flowers about August, and is distinguished from the others of the genus "by oblongly lanceolate widely toothed revolutely edged leaves, by panicles which are not level-topped as in the others, and by pedicles shorter than the calyx." The drawing was taken at the nursery of Messrs. Malcolm and Co., Kensington, where this scarce plant is very successfully treated.’ [BR f.491/1820]. Saint-Hilaire Arb. pl.3/1824. ‘Heteromeles arbutifolia is distributed through the Californian coast regions from Mendocino County to Lower California; it is most common, and reaches its largest size on the islands off the California coast and extends inland to the foothills of the Sierra Nevada and San Bernardino Mountains. It generally grows in the neighborhood of streams, on dry hills, and especially on their northern slopes, and is often found clinging to the steep cliffs of the coast fully exposed to the sweep of ocean gales; on the island of Santa Catalina, where it is very abundant, it forms groves of considerable extent, and on the foothills of the Sierras, where it ascends to elevations of two thousand feet above the level of the sea, it usually grows as a shrub. The fruit-covered branches are gathered in large quantities and are used in California for Christmas decorations. Heteromeles arbutifolia was discovered by Archibald Menzies, the Scotch surgeon who accompanied Vancouver to the northwest coast of America, and, in 1796, introduced it into English gardens.’ [Sargent - The Silva of North America vol.IV, p.123/1892]. Listed in all published catalogues [T.753/1843]. More details about Heteromeles arbutifolia (Ait.) M.Roem.